For a minimal investment, though, you can find your own piece of sunken treasure without getting wet. And if you play your cards right, it might even produce a profit. While no data exists on average appreciation rates, treasures salvaged from shipwrecks tend to hold their value best when they’re in good condition and hail from famous wrecks, like the Atocha, the Spanish galleon lost off the Florida Keys during a hurricane in 1622. 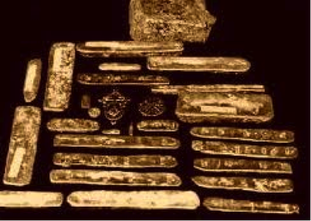 The ship, found in 1985 by Mel Fisher, was still carrying a $450 million cache including over 40 tons of silver and gold, Colombian emeralds, gold coins, silver and gold artifacts and over 1,000 silver bars. Today, the Mel Fischer Maritime Museum in Key West, which displays some of the items, draws roughly 200,000 visitors per year. But some of the items are also for sale, according to its Web site. High-grade authentic silver coin Reales from the ship sell for anywhere from $4,000 to $14,000. Likewise, an Atocha gold bar is listed for $88,000, an emerald ring for $150,000, a gold filigree locket with gold chain for $400,000, and a gold and emerald brooch for $1.1 million. Metal coins and porcelain pieces recovered from less noteworthy wrecks, however, can be had for as little as $5. It all depends on your budget.